WAIST HIGH: The New "A Little Respect (HMI Redux)" Single For Charity Is Now Available. The New "A Little Respect (HMI Redux)" Single For Charity Is Now Available. 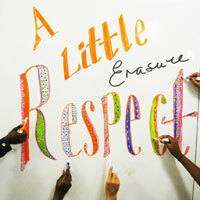 Erasure have recorded a brand new version of their 1988 song "A Little Respect" (HMI Redux) and it is available today on iTunes in the USA. From Erasure News: Proceeds from the track will be donated to The Hetrick-Martin Institute, the home of the Harvey Milk High School, in New York, and the True Colors Fund. The Hetrick-Martin Institute, the nation’s oldest and largest LGBTQ youth service organization, provides a safe and supportive environment to all young people - regardless of their sexual orientation or gender identity so that they can achieve their full potential. In the wake of all the gay bullying and related suicides that have been reported in the US over the past several months, Erasure wanted to do something special to spread a message of tolerance and to raise money for an organisation that engages in the fight on a daily basis and, because it has become something of a gay rights anthem over the years, it seemed only fitting to release a brand new version of "A Little Respect."